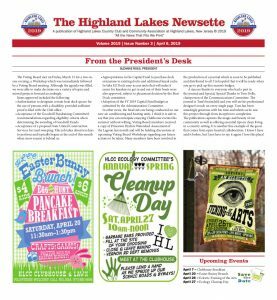 Nearly every article that appears in each issue of the Highland Lakes Newsette is written by individual members of our community. Writers do not receive any compensation for their stories, but the Newsette continues to thrive as a news source for our community through the editorial efforts of individual members, committee chairpersons, Trustees and Officers, and others who contribute articles and information on a regular basis. Additionally, the Newsette is produced by the office staff and members of the Communications committee in conjunction with a local printer who uses modern digital production technology to lay out and print the Newsette. All articles and photos must be emailed to hlcc@warwick.net. Every effort must be made for articles to be submitted by noon on the Friday before the week of publication. In no cases will articles received after noon on the Monday prior to the publishing date (see “Deadlines to submit your story/photos” below for more information about deadlines) be accepted. Articles can be typed in the body of the email, and both articles and photo can be submitted as a Microsoft Word email attachment. All submissions must include the author’s byline, as well as suggested headlines and subheads (essentially headlines for sections of your article). If you do not have access to a computer and/or the internet, you will need to coordinate with someone else on your committee or within your group for assistance. Articles that aren’t submitted via email cannot be accepted. The Newsette is published on a weekly basis throughout the summer from late June through August. 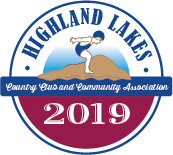 After the summer season, it is published monthly on the first Saturday of every month from October through May except January, with an additional issue published on the Saturday prior to Memorial Day. The Newsette is published on Saturdays, and every effort must be made for articles to be submitted by noon on the Friday before the week of publication. Of course, articles related to activities and events that took place the preceding weekend may be submitted Monday mornings by noon. Under no circumstances will submissions be accepted after noon on Monday. Any photos you send to us for publication must be in a digital file format — sorry, no traditional print photos–and the resolution must be at least 150 dpi (which stands for dots per inch). If you don’t know how to confirm your photo’s resolution, look at its file size — if it’s 1MB or more, its resolution is probably high enough for use. (Photos that aren’t submitted via email cannot be accepted.) Color photos can be submitted, but may be published in black-and-white depending upon where your article appears in the issue. 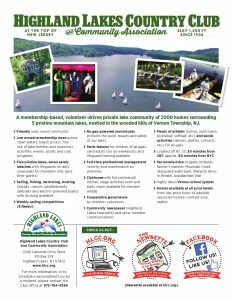 See our advertising rate sheet for information about placing an ad in the Newsette. Please email the Newsette’s editorial team at hlcc@warwick.net with any questions.